August 28, Apia, Samoa. Today young people from the Africa, Caribbean and Pacific gathered together at the To’oa Salamasina Hall, Sogi, Apia for the second and last day of the Youth Forum as part of the preparatory activities for the Third International Conference for Small Island Developing States. 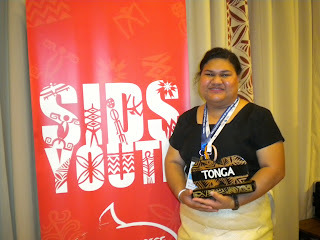 The International Fund for Agricultural Development (IFAD) is committed to enhancing opportunities for rural youth in small island developing states and has supported the participation in the Forum of Aulola Silua Toomeilangi ‘AKE, a young M&E coordinator for the Tonga Rural Innovation Project, implemented by MORDI Tonga Trust. Participants at the Youth Forum, Apia, Samoa. The MORDI project staff have completed community development plans together with men’s and women’s groups as well as youth groups. In this process Aulola noted that the lack of access to technology (i.e. computers) and ICT skills was a key hurdle for the rural youth in Tonga. The main take away message for Aulola is that “we need to work more with youth and integrate their needs in Tonga, also through the MORDI project that provides a framework for doing so." Because of the way it is structured MORDI offers opportunities for bringing in a bottom-up perspective. Often work on youth-related issues is very top down and the Regional Youth Councils only work with national representatives. The thing that Aulola loved the most about taking part in the Youth Forum was the South-South learning experience. She was really interested in an initiative from the AIMS region and she will be in touch via e-mail with the AIMS representative. “The best was that we did not stay within the Pacific circuit but were able to interact with people from the different countries”.